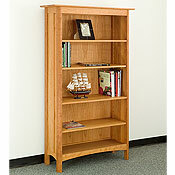 New England Wood Chatham bookcase with 5 adjustable shelves. Choose from solid cherry, maple or walnut wood. 72'H x 41'W x 14.5'D. Hand-crafted with high quality, solid cherry, maple or walnut hardwood and hand-rubbed with linseed oil finish. 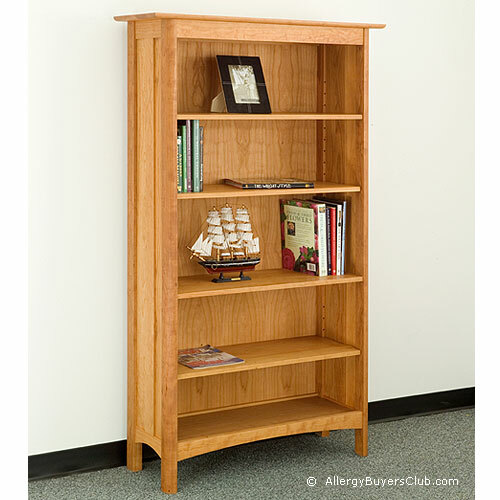 Our New England Wood Chatham 5-shelf bookcase made of solid wood furniture is designed to structurally last in your home decor for years to come. The Chatham design is a perfect blend of classic lines with elegant round touches, distinctive functionality and undeniable durability. Each aspect of this gorgeous piece is made from the finest woods and carefully hand-crafted by experienced craftsmen using modern and traditional techniques. Its hand-rubbed linseed oil is less toxic to your family and environment than standard lacquer finishes. Features 5 solid adjustable shelves and available in cherry, maple or walnut wood. The 5-shelf bookcase is securely joined together with mortise and tenon joints to gain the superior strength and flexibility of movement allowed when one block of wood is inserted into another. All pieces are made with classic, high quality, solid cherry, maple or walnut hardwood, sanded smooth and hand rubbed with linseed oil finish.